When the box of Golden Door Spa food products arrived, I was excited to see that the ingredients are all organic and locally sourced. Kudos to the Golden Door! As many of you know, I eat a very clean, organic and primarily local diet. It all began as a kid with my live-in Italian grandparents and it now it is paramount in my life because my husband Jim has celiac disease and I have some weird stomach issues. So, how do I create a recipe that is both a nod to my Italian past, and embodies my current restrictions and my philosophy? Easy, peasy! 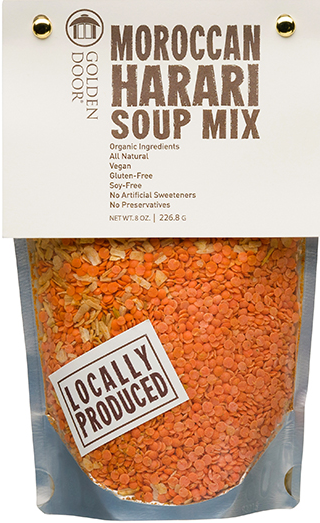 I took one look at the packages that arrived and knew I would use the red lentil soup mix: Moroccan Harrari Soup Mix. I am an old-fashioned concoctor. I mostly cook by feel, flavor and what I have on hand. I keep a rather stocked pantry and fridge, so I can run wild most days!! I had some cooked jasmine rice in the fridge. So, it occurred to me that if I made the soup recipe and added the rice and let it simmer for a while, I would have the consistency of risotto. And who doesn’t LOVE risotto? 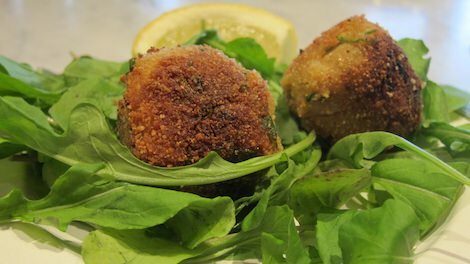 Better yet, who doesn’t like leftover risotto re-imagined as “Arancini” – risotto balls or cakes? So, this recipe is really a two for one!! First by simply adding the rice, we create the Moroccan Harari Risotto and then with the left overs, the arancin! I love getting two meals out of one dish!! So, I present….The Golden Door Moroccan Harari Arancini….golden fried balls of perfection. The Moroccan flavor profile that Chef Michael Stroot created combined with a little Italian juju…… and voila. Truth be told, I didn’t want to challenge the wonderfully balanced spice blend that Chef created. The hints of coriander, fennel, cumin, cinnamon, paprika, black pepper, turmeric, salt, red chili, onion and garlic were enough to carry the day. I just doctored them up to provide a different delivery vehicle!! And I didn’t have to do much. Some rice, cilantro, red onion, mozzarella cheese and gluten free breadcrumbs. They are as delicious as they are inviting. I had to slap Jim’s hand as he went to grab one before I finished cooking all of them. 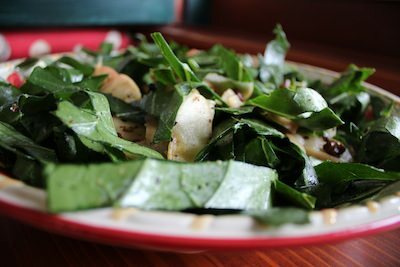 I served them with a lemon wedge over an arugula salad dressed with a little olive oil, lemon juice and balsamic vinegar. A perfect way to devour the leftover Moroccan Harari Risotto!! It's funny how we take for granted the things we know how to do and just do them. It happens in all aspects of our lives - the things we do most naturally and happily are sometimes the things we need to think about and value more in ourselves. When it comes to cooking there are so many little things that I just do. I do them because I learned them by observation as a kid or in a cooking class along the way. Nevertheless, one of those things my mom and nana made all the time was a soffritto - as a base for soups, stews, sauces etc. Simply put it is the slow frying of onions, celery, carrots and garlic. Sometime, I add herbs like thyme, oregano or basil, salt and pepper. But the technique is always the same. Heat up some oil, add the chopped onions first, then the carrots and celery, saving the garlic and any herbs for last. Once it is slighly golden and aromatic, I add my soup stock, wine or more ingredients. I make lentil soup, beef stew and my latest concoction that I will be making on Newschannel13 on Sunday, Potato Leek Soup this way. Perhaps you have a technique that you use that shows up in many of your dishes? I would love to hear all about it. What do I do with those Zucchini Bats? It's that time of year. Somehow even with a watchful eye, those sneaky zucchini grow into large baseball bats. One minute they are too small and the next, a weapon!! My grandmother used to stuff her zucchini so I tried to recreate a similar recipe. My garden has an abundance of Swiss chard as well so I wanted to use both ingredients. 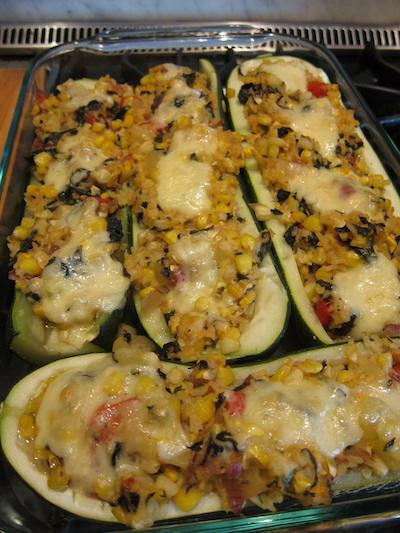 Click on the image of my zucchini boats below for the recipe. I know it will come in handy if you have the same crafty zucchini plants in your garden!! "The recipe is not mine. It's from Epicurious. And I still love it. 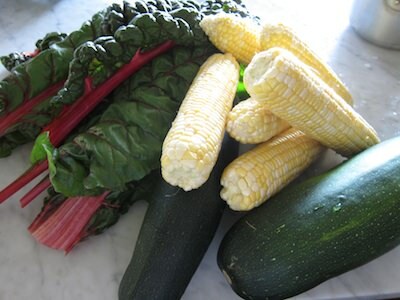 When I moved to New Hampshire form California in 2000, I dearly missed all the fresh veggies and greens I picked up every week at my local farmers market. One day I picked up a Gourmet and found that recipe. 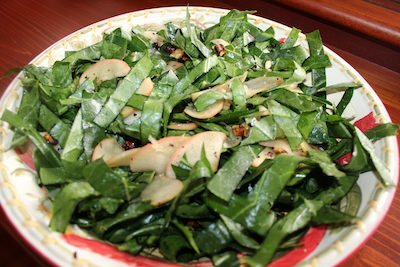 I made it countless times that first year, because collards are plentiful in New England markets.I brought it to a pot luck once and the description of Shredded Collard Greens with Walnuts and Pickled Apples was not exactly a big enticement to folks to try the salad. So a friend told me to change the name to:Winter Green Salad with Walnuts and Apples. I did. And the salad is always a hit." So the interns and I decided to try it out, we picked the collards, and did the pickling of the apples. And this is how the salad turned. We hope you will try this tasty salad. Here are some pictures of how it turned out, it's quite pretty, and yummy too! 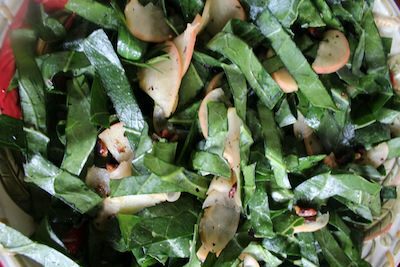 The recipe can be found here Winter Green Salad with Walnuts and Apples. With that being said, I hope you all will try out my Lobster Risotto recipe, or at the very least enjoy National Lobster Day! It's World Ocean's Day today and it's all about cherishing the oceans and encouraging us to eat "sustainable seafood." But that's where I have a problem. What is sustainable? Marion Nestle defined it in my radio interview with her as "What you take out, you put back?" I can't get my head around that one as it relates to seafood. And I think we all get confused by the latest nutrition mantras - eat lots of salmon because it has the most omega-3's. All of the sudden, everyone wants salmon which in turn leads to over-fishing, poorly farmed versions and a conundrum for deep thinkers like me. So, I basically avoid salmon for the most part and "vote with my fork." I think we should look for local catches or in-season fish whenever possible. But that's a simple, over-generalization that I don't really understand. 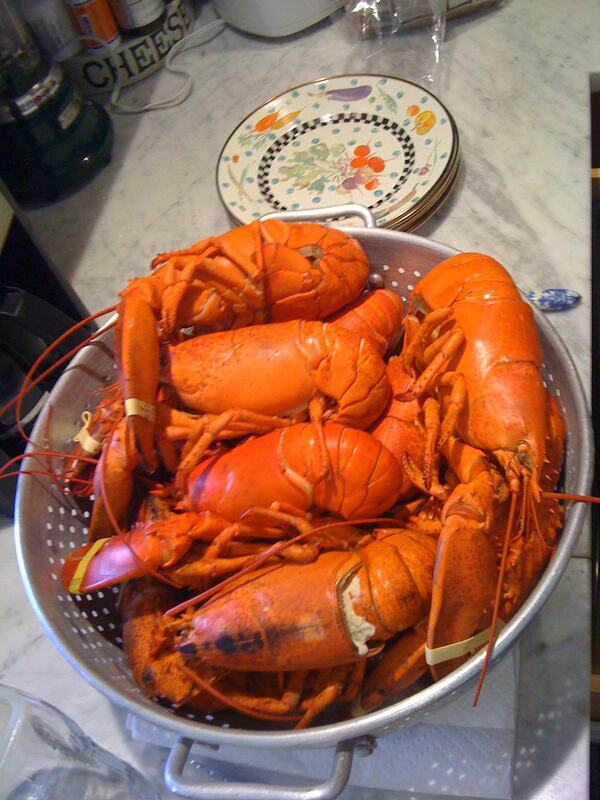 When I visit my parents in Rhode Island it seems that Atlantic Cod would be a great choice, or perhaps lobster. Are these sustainable? SO I do my homework and find out that "local" Atlantic cod is not sustainable, but Maine lobster is OK. Well goodie for me because I LOVE lobster!! But I love cod. What to do? So confused!! One the best resources I have found on the subject is the Monterey Bay Aquarium website. They have apps and information on better choices. So for today, I decided that we'd have scallops which are for the most part a good choice - phew!! And, believe it or not CLAMS are sustainable, too. Here's a recipe for Linguine with Clam Sauce. I'd love your thoughts about the sustainability of seafood issue. I doubt our grandparents had to think much about it.